New Spanco Bridge Crane Brochure! New Workstation Bridge Crane Brochure Available for Download! Over the past few months we’ve been working diligently to update our literature and create a more effective workstation bridge crane brochure. We’re happy to announce that our new brochure is available for download on our literature page. The new brochure effectively combines our full line of workstation bridge cranes into one comprehensive catalog that includes our Freestanding (stand alone) system, Ceiling-Mounted system, Monorail System, and Alu-Track system. The new Spanco Workstation Bridge Crane brochure will be available for print in mid-July. Spanco employees have been coming together to enjoy food and fun at our annual company barbeque for eleven years now. This year was no exception. The weather was perfect, and the food was awesome. Stampede Smokin’ BBQ in Morgantown, PA, provided a full BBQ spread, which included pulled pork, spare ribs, and brisket, along with several fabulous appetizers and sides. Although the food was the highlight of the day, there were also several fun activities and entertainment for the 95 Spanco employees and family members who attended. 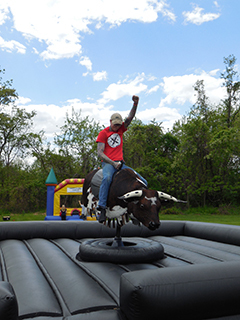 Three Monkey’s Inflatable’s provided hours of entertainment for the kids with their inflatable bounce house and mechanical bull. 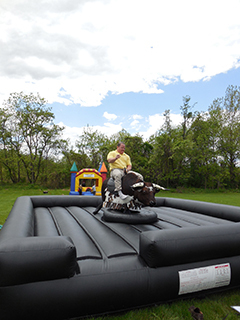 The mechanical bull was a fun activity for children and adults alike, but staying in the saddle was no easy feat! For employees with a competitive streak, we also hosted our second annual pie- eating contest. The contest included nine Spanco employees dueling to the death to get rich or pie trying! 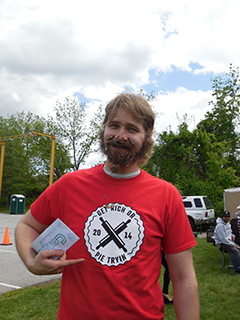 This year’s winner took home the coveted title of Pie Eating Champion, along with a 250-dollar cash prize. It was a close competition, but the 2014 Spanco Pie Eating championship title went to Mr. Joe Powning. In addition to the pie-eating contest, Spanco employees could enter their raffle ticket into a drawing to win one of three raffle prizes. This year’s prizes included a Sheetz gift card, a Cabela’s gift card, and an Amazon gift card. 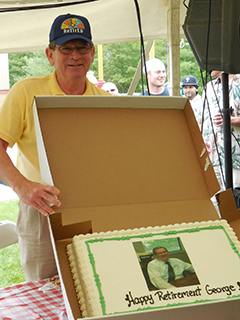 The 2014 company barbeque was bittersweet because we were also saying goodbye to George Nolan, Vice President of Sales and Chief Operating Officer for Spanco. George started working for Spanco in July of 1984, and he has been an instrumental part of the company’s evolution over the last 30 years. George’s vast knowledge of the material handling industry, charming personality, and witty sense of humor will be sorely missed. We’d like to wish George a happy, healthy, and golf-filled retirement—may his game be filled with nothing but birdies and eagles! A Pennsylvania based distribution facility installed a customized ceiling-mounted workstation bridge crane from Spanco to streamline their shipping process and create a safer, more efficient workflow. The ceiling mounted bridge crane needed to extend past the runway on each side to pick up loads and place them on skidders from the aisles. To accommodate their needs, engineers at Spanco designed a dual telescoping bridge, which reaches an additional 10 feet in either direction. This setup requires two workers, one man to hold the bridge from telescoping with a nylon rope and one to pull the load. The new overhead crane system from Spanco has maximized their total coverage and created a viable and effective material handling solution that supports their unique operation and streamlines productivity. Crane operator conduct is an important part of maintaining a safe environment for employees working with and around overhead crane systems. This is particularly true for workers using fall protection in an industrial crane environment. People often make the mistake of thinking that hand signals only apply to large cranes where the operator sits in a cab. But, OSHA and ASME describe the use of hand signals as a necessary part of operator conduct when visibility is low due to multiple factors or when moving a load could create a potential hazard for operators or workers near the crane. The crane industry has seen many fatalities due to insufficient fall protection for technicians who need to access facility cranes. Crane maintenance and inspections require workers to access overhead systems in tight areas that limit mobility. There is also little information available about how to effectively operate industrial cranes around workers using fall protection systems that are tied off to an overhead attachment. In these circumstances, overhead cranes and overhead fall protection must work in the same space without coming into contact with one another. So, what steps can employers take to provide adequate protection for employees working on, above, adjacent to, or beneath a crane? Gantry cranes come with multiple options and accessories, which can help to better tailor your system to your operation. One of the most useful options and accessories regarding gantry cranes is track mounting. Track mounting is useful for applications requiring lift and movement over a fixed route. Tracks are used for manual or motorized travel, depending on the type of gantry crane, type of track, and your operation. If you are considering a track mounted gantry crane, it’s important to know what types of tracks are most commonly offered, which will best serve your application, and their power drive options. Most manufacturers offer three types of track options for travel over a fixed route: V-Groove track, Guide Angle track, and Trackless—with or without guide angles.